And it'll start later this year — by the end of summer if all goes well. We’ve seen it happen with every generation of wireless before: 1G all the way through 4G. But even though past gains have been massive, they won’t be able to hold a candle to what we’re about to see with 5G. And I’ve pinpointed THREE companies that will absolutely explode over the next few months as 5G becomes a reality in cities across the globe. As I mentioned, those three companies — and their ticker symbols — are included in my newest report, "Ultranet Profits: Top 3 Stocks for Riding the 5G Revolution." The kinds of stocks that people will be talking about in a few years, wishing they'd bought them. BONUS REPORT No. 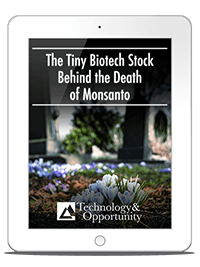 1: "How to Make up to 181 Times Your Money From the Death of Monsanto." This breakthrough can be used on virtually ANY crop. And it has the power to end food shortages forever. This bonus report has the name of the company, its ticker, and trading instructions on how to maximize your potential profits. BONUS REPORT No. 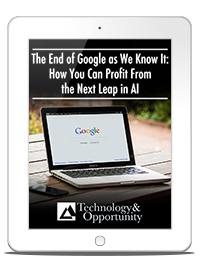 2: "The End of Google as We Know It: How You Can Profit From the Next Leap in AI." Bill Gates calls it the "holy grail." Jeff Bezos says it’s "gigantic." And right now, Apple, Google, Facebook, Amazon, IBM, and virtually every other high-tech titan is working day and night to bring the next generation of artificial intelligence (AI) to life. How do you play this situation for massive gains? You'll find out in the second bonus report that you’ll receive today. 12 Monthly Issues of Technology and Opportunity Each Year: Our issues are jam-packed with new and exciting research on the hottest technology companies on the planet. Every month, I'll tell you about a breakthrough company that has the potential to change the world. You'll get the name of the company, its stock symbol, and specific instructions to help you in investing for maximum profits. Unlimited Access to the Private, Members-Only Website: Read all our back issues and reports. And stay up to date on all the cutting-edge technology opportunities that I uncover. World-Class Customer Support: Whenever questions or problems arise, you can give the Technology and Opportunity's support staff a call. You'll receive immediate, live help, Monday through Friday between 9:30 a.m. and 4:30 p.m. (ET). You have nothing to lose. Reserve your space now to test-drive Technology and Opportunity for 30 days without any obligation. If you’re not thrilled, for any reason, all you'll have to do is contact Angel Publishing’s support team. You’ll receive a full and prompt refund. Even if you decide to cancel your subscription, you'll still keep everything. That includes the three special reports outlined above. So, subscribe — risk free — to Technology and Opportunity now. When you subscribe to Technology and Opportunity with your credit card, you will be billed that subscription choice rate. Every 12 months thereafter, we will automatically bill your card for $249, the lowest renewal rate we offer. With this auto-renew feature, you lock in the lowest available price and guarantee that you never miss an issue or a recommendation of Technology and Opportunity. This auto-renew feature does not obligate you in any way; you may opt out of auto-renew at any time after this purchase, and you can still cancel within the first 30 days to receive a full refund.